UNDER MY SKIN Sinatra fans will love Cinnibar’s ‘My Way,’ but the rest of us will be left wanting more. That's certainly the case with My Way: A Musical Tribute to Frank Sinatra, now playing in a cozy, cabaret setting at Cinnabar Theater. Anyone who feels their pulse quicken at the opening strains of "Fly Me to the Moon," or for whom the Rat Pack songbook exists as a poignant soundtrack to their lives, will likely be ecstatic from beginning to end. For such folks, there will be plenty of drama in the sweet or sad memories surfacing through the pleasant (but rarely very exciting) performances of Desiree Goyette-Bogas, Rocky Blumhagen, Carolyn Bacon and Mark Robinson singing dozens of Sinatra's most famous songs. Everyone else will probably walk away thinking, "Meh." 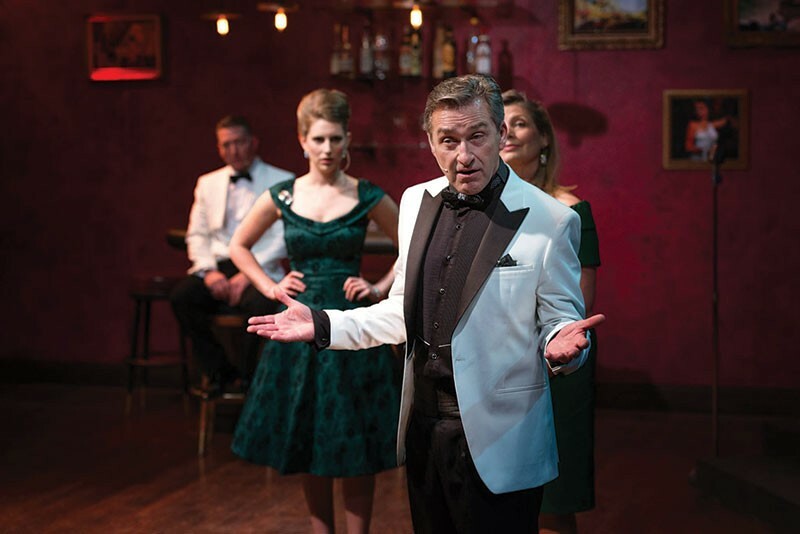 My Way, directed by Jennifer King, who certainly creates some pretty stage pictures, is certainly a classy affair, what with its quartet of singers dressed in tuxedos and evening gowns. The band—musical director Cesar Cancino (piano), Jan Martinelli (bass) and Randy Hood (drums)—is easily the best part of the show. They are so much fun to watch and listen to, at times I wished they'd been given a medley of songs to play themselves, sans lyrics. The "script," if that's even the right word, is by Todd Olson, who randomly has the cast drop trivia tidbits, about Sinatra's birth weight, his love of the moon, his various romances and wives. The songs are primarily presented in clusters, delineated by subjects—love, alcohol, aging, various cities, which almost gives the show a glimmer of plot now and then. Still, even at the evening's frequently soporific pace, there are moments of true pleasure—when a four-part harmony soars, or two singers actually make eye contact and pleasantly remind us what it's like to fall in love. At such moments, especially for those in the audience who fell in love to a Sinatra tune, My Way reminds us just how exciting a singer Sinatra was. If only this show were as interesting or thrilling as he was. 'My Way: A Musical Tribute to Frank Sinatra' runs through Dec. 14 at Cinnabar Theater, 3333 Petaluma Blvd. N., Petaluma. Friday–Saturday, 8pm; Sunday, 2pm. $25–$45. 707.763.8920.